Amnesty activists, union workers, and LGBT rights activists rallied against President Donald Trump on Monday in Los Angeles and San Diego ahead of arrival in the Golden State. “We welcomed all the presidents that have come before him to this great state, but what we will not welcome are seeds of division and hate,” Angelica Salas, executive director of the Coalition for Humane Immigrant Rights, said during a rally in Beverly Hills, according to the Los Angeles Times. 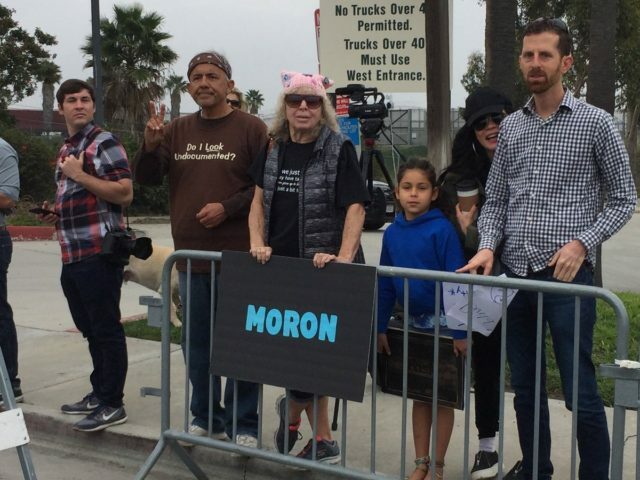 California Senate President Pro Tem Kevin De León (D-Los Angeles), who is running against incumbent Sen. Dianne Feinstein (D-CA), also spoke at the anti-Trump protest on Monday. Several dozen protesters also came out to oppose Trump’s planned border wall in Chicano Park, in San Diego, ahead of his visit to see the border wall prototypes. Congressman Juan Vargas (D-San Diego), who has vowed to lead the fight to have Trump impeached, spoke at the Chicago Park protest. Vargas was one of the few Democrats in his party to oppose to nuclear Iran deal. During Trump’s visit to Southern California on Tuesday, the Progressive Volunteer Network Santa Monica, Indivisible Los Angeles, Indivisible South Bay Los Angeles, The Resistance – Northridge Indivisible, and the Venice Resistance will hold a “Trump is NOT Welcome Here Protest!” between 5 p.m. – 8 p.m. PDT at the Beverly Gardens Park in Beverly Hills. According to the Fresno Bee, anti-Trump activists called off a protest planned for Wednesday, saying a visit to Fresno was unlikely on the president’s California tour. “As of this moment, it doesn’t appear that Trump will be coming to town,” a group called the Fresno Resistance said Monday.